Who among us has not gone through a horrible Monday or haircut or breakup and headed straight for the freezer section at the convenience store, looking for their ice cream drug of choice? (My favorite: Ben & Jerry’s Strawberry Cheesecake. But I will also accept Häagen-Dazs Chocolate Peanut Butter). As much we try not to, before we know it, we’re scraping the dreaded bottom of the pint with our spoon while curled up in front of our favorite tear-jerker movie. At that point, it just seems silly to save something that small, so we usually finish the whole thing. And feel gross, now that we’ve inhaled 1,000-plus calories that we really didn’t need. 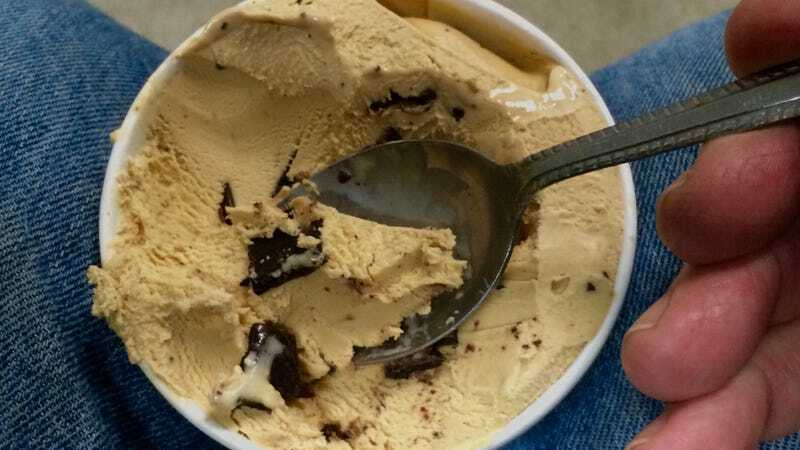 Good news, ice-cream-pint lovers: The Wall Street Journal has announced that “Eating a Whole Pint of Ice Cream at Once Is OK Now.” Whew, what a relief! But since the WSJ doesn’t really know anything about our poor diet and exercise habits, this seems a little suspect, frankly. Turns out that it’s not the amount that’s changed, but what’s in those little (okay, not so little) adorable cups. Brands like Halo have been so successful, Ben & Jerry’s has even introduced its own low-calorie line called “Moo-phoria,” and Breyer’s has added “Delights.” We know Halo fared fairly well when we recently did a Taste Test on them here, but the quantity-over-quality credo is not a great selling point. Still, we’d be willing to try it out the next time we get a bad haircut, for a little less guilt to go along with our solace ice cream.